The Dark Ranger: Pre Season... The Continuation of Last Season. The preseason is underway. 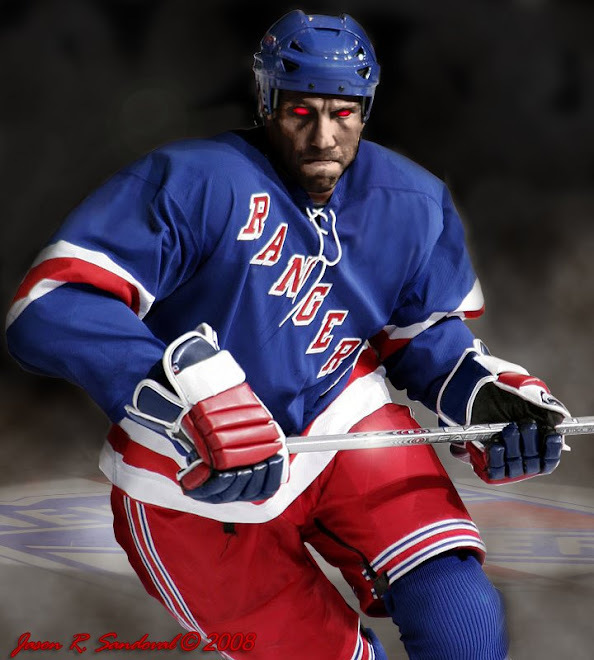 Aside from the huge hole left in ranger fans hearts for a fallen Enforcer (RIP Boogey) and the fact that our stadium is still not finished yet. We've trudged on and arrived at the doorstep of another season. One game in, I have to tell you.... I'm already getting flashbacks to last season. Get the official recap of the game here. We have lots of candidates and few opportunities for spots on the roster. So we'll have a better chance of finding the right or right-ish guys for the job. The kids seem eager to impress and full of energy and effort, but they're still on the small side which means, they were getting out muscled and lined up for hits all nights. Talbot showed some good potential in Goal. Especially in robbing Sykora on the second chance attempt. I won't get high on him yet. Potential is good but it goes nowhere unless you get some practice in the big time. Ask Chad Johnson. We netted some Second Gen guys like Erixon and Borgue have that little bit of extra guidance which has helped their maturity as players. While Lou Lamoriello is still calling their houses asking if their dads wanna suit up and play and digging up guys like Sykora and returning meathead, Cam Janssen. Bigger bodies could be on the way. While were happy to have Rupp. We need to start home growing some bigger kids of our own. A kid like McIlrath showed he knows how to use his size showed me more in 60 minutes than Jessiman did in his whole time with the Rangers. Is it too early for fans to start sending this kid some protein powder? Dubinsky is still playing strong and hasn't seemed adversely affected by being overlooked for captaincy. He still speaks up on behalf of his team. Girardi, Christensen looked a little ho hum. Probably still looking to shake off the cobwebs. Emminger shows he'll still be the heavier hitter on a the defensive squad. This team seems to be conforming well to the NHL benchmark (penguins) image forced on the teams by the league. Young captain, more skate than hate, star goalie, aging vet, agitator, and the lunch pail 4th line. A special thanks to all of you Dark Fans for your patience with us over the summer.... Welcome back. Next Game Friday..